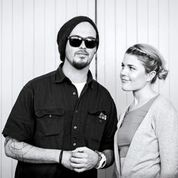 The unique appeal of the pair ebbs and flows between their mutual respect and love of the variable genres their sound comprises of, be it funk, hip hop, dub or reggae. An appeal that has landed them on the support stage at this year’s upcoming Soulfest Music Festival in Sydney, a position that will no doubt thrust this very laidback outfit into revered recognisable status… not bad for a group that have only been in circulation since early 2014! Their story is one of chances taken and stepping out on faith, as a chance discovery of a USB housing Jayo’s impeccable beat production and sample reshaping was passed on from friend to friend, landing in the right hands and the rest they say is history. With their new single “Do You Really?’ featuring the Brass Knuckle Band released on June 5th gaining significant radio play across top national radio platforms like Triple J, Double J and FBI radio, Yum Yum are making their mark for good. 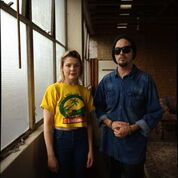 Kudos to the grind of Jayo and Natalie and I appreciate them for taking some time out from their live performance schedule to chat to me about their steady takeover of Sydney’s inner soul community and how sometimes not overthinking things can sometimes lead to your destiny! Hi Jayo and Natalie, how are you both? How has life been treating you? Really good thanks. Lots of music, so great. It was mixture of a few wines plus a mumbled conversation about an artist that Jayo had playing at the time called Yungun (aka Essa). I thought Jayo had said ‘Yum Yum’. We joked that it’d be a good graffiti name for Nat, which is just silly coz she can’t draw. Then when someone asked what our band name was we were like… Ummm… Yum Yum? Tell us about your sound and style and what you think makes you stand out from the rest? We both love soul music as well as hip hop, blues and dub, so those are the predominant styles we end up playing with. I guess the only thing that can make anyone ‘stand out’ these days is your own unique ‘gumball’ of influences. For Nat, it’s mostly jazz music and for Jayo it’s more soul & hip hop. It’s that combination of differences that makes us up, so I guess that’s what makes it different. You create what could best be described as a hybrid of soul, hip hop, funk and dub sounds paired together with impeccable song writing. What are your thoughts on the music being created in today’s urban music community in Australia? “Impeccable”… wow, thank you. We’ve been lucky enough to work with lots of local artists like Hau, Setwun, Cooking with Caustic and to be a part of groups that are really pushing soul music in Sydney like Soul of Sydney & Funkdafied. The “Urban” music being created in Australia is a lot more diverse than in years past, both in terms of the people making it and the creative boundaries that are being pushed, which is a positive thing. Obviously different styles go in and out of fashion but I think you can definitely say that urban music in Australia is growing and getting a lot stronger so it’s great to be a part of that movement of creativity. We just dropped our new single called “Do you Really?” We got to work with a bunch of musos we love like Fearless Aks on guitar, Patrick Torres on Bass, The Brass Knuckle Brass Band from Canberra on brass, and DanielSan on the mix and master. It’s been fun to work on this one coz we’ve been able to include more people in this process. We also just dropped the video clip for this one thanks to our good friend Bryce Hooper (Till the Casket Drops)! Next up is our EP launch on the 17th of July… And we’re really excited to be able to play the new songs in our sets. Who would you say are your musical influences and why? Nat: I’m all about the jazz vocalists like Nancy Wilson and Ella Fitzgerald. They’re perfect on so many levels. Jayo: My influences have mainly been from African American music which is obviously a massive output of styles and artists. That list is very long so major influences are Sly Stone, Parliament funkadelic, James Brown, Shuggie Otis, Al Green, Curtis Mayfield, Kool Herc, Kool DJ Red Alert, Afrika Bambaataa, Marley Marl, Mantronix, Pete Rock, DJ Premier, RZA, J Dilla, Madlib, DJ Vadim. I could go on and on, haha! I also take a lot of influence from the great dub engineers like King Tubby and King Jammy. Jayo on Natalie and Natalie on Jayo – what is the greatest strength in this collaboration? Nat on Jayo: We have a great chemistry as people and as artists which is a great start but most importantly, I love the sound that Jayo creates. He creates these beautifully soulful, melodic, groovy as f*ck beats that just make you wanna sing all over them!! Jayo on Nat: She has such an incredible voice so of course that was the first thing that grabbed my attention. When she sings you can really feel the soul, emotion and character in her voice, this along with beautiful song writing skills that flow naturally and a really strong energy on stage are what push me to get deeper and to grow and develop my sound. Nat: Music, Love, day-to-day life. It’s all pretty incredible stuff really…. Great to write songs about it all! Jayo: My family and friends are my biggest inspiration and music has been my greatest passion since quite a young age. After listening to so much great music for so long it’s hard not be inspired. These all combine to motivate me to move forward while keeping me grounded at the same time. Reblogged this on SOUL OF SYDNEY: Dancing In The KEY of LIFE.